Zoom through the Costa Rican jungle on a full-day zip-lining tour in San Ramon. The tour is perfect for adrenaline junkies and active families alike. Thanks to provided safety equipment and the watchful eye of your experienced guide, you’re able to sail through the cloud forest with ease. 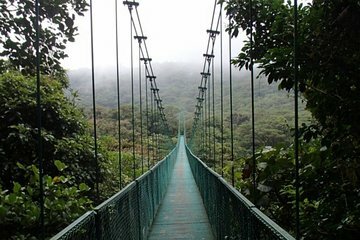 Walk across six hanging bridges, measuring up to 360 feet across (110 meters). Along the way, keep your eyes peeled for hummingbirds, sloths, and monkeys. We pick up at Alajuela, Heredia and San Jose.